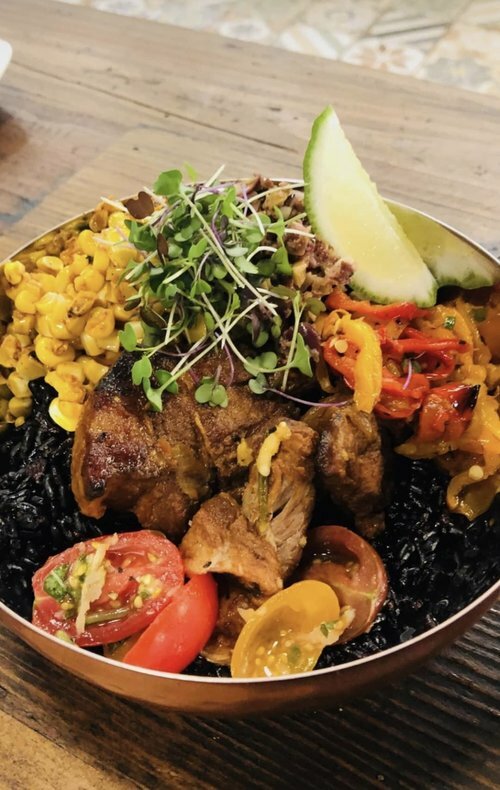 El TOro - braised pork shoulder, black rice, heirloom tomato salad, warm olive tapenade, charred corn succotash, chili oil, and micro cilantro. Brass Bowl: Kitchen and Juicery opened their doors earlier this month at 656 Central Avenue. The menu consists of bowls, flatbreads, juice bowls, cold-pressed juices, and more. Chef Jason Gordon’s mission is to offer delicious, healthy food that rivals fine dining in a quick-service environment (i.e. order at the counter). Impressively, the eatery has no freezers, no fryers, and no heat lamps. Also, Chef Gordon is hoping to get Brass Bowl certified organic by the USDA, which requires that 95% or more of the ingredients be organic. Talk about fresh! Our favorite dish so far is the Hunter Gatherer bowl — 24-hour sous vide hanger steak, black rice, fire-roasted sweet peppers, smoked foraged mushrooms, four-herb pesto and forest herbs. The developers behind ONE St. Petersburg, a recently constructed 41-story condo and hotel project, have announced plans for their second tower in Downtown St. Pete. The new 35-story tower, tentatively dubbed Bayfront St. Petersburg, is proposed just three blocks south of ONE in the parking lot of the Hilton Bayfront Hotel and directly across from Al Lang Stadium. The development will include 200 condominiums and 10,000 square feet of ground-level retail. At just over 400 feet, Bayfront St. Petersburg will become one of St. Pete’s tallest buildings, second only to the 450-foot ONE St. Petersburg. A sales center is slated to open in summer 2019. WEPA!, St. Petersburg's first authentic Puerto Rican restaurant, opened last month at 2149 3rd Avenue South (across from 3 Daughters Brewing). The inside seating area can accommodate around 20 diners with an additional 16 seats outside. Most menu items were developed from hand-written recipes passed down over three generations. Don’t leave without trying the chicharrones de pollo (fried chicken), the bistec encebollado (beefsteak with grilled onions) and then the flan de caramelo (caramel flan) for dessert! Kenwood's Organic Produce opened last month at 3325 5th Avenue North in Historic Kenwood. The owners work with half a dozen farmers and growers in Pinellas, Hillsborough and Manatee counties to bring their customers the most local fruits and veggies possible. Best of all, none of their growers use harmful pesticides or GMO plants. They also have a community courtyard that'll host events such as family yoga, zero-waste meet-ups, discussions on bio-hacking, and much more. Green Bench Brewing Co.’s new two-story tasting room, Webb's City Cellar, is now open at 1120 Baum Avenue North (next door to their existing brewery). Focused on serving mixed-culture and wild ales, the additional space overlooks the new cellar area and improved beer garden. The new cellar has the capacity to hold 700 barrels, which are often used to add complexity to the beers. These improvements are part of a larger $3.4 million expansion project for Green Bench, which also included a new canning line, beer garden upgrades, and even more brewing space which tripled the brewery's beer capacity.